You think that stone comes from the outside, so you should always be able to use it outdoors right? Anywhere that has freeze/ thaw conditions you need to be careful about which stones you put outside. There are certain stones that just don't hold up with all the freezing/ expanding/ thawing. 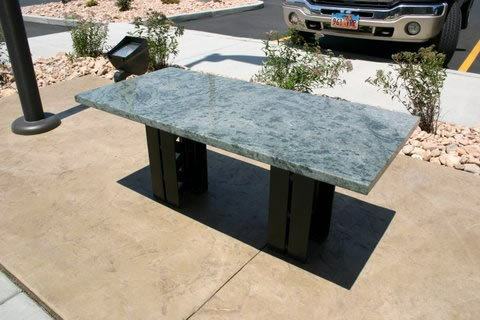 Ask your fabricator or supplier if that stone can go outside before you buy! The same goes for all types of tile. If you live in Minnesota don't fret though. There are plenty of options! The photo above is an outdoor bench that we did here in Utah. It's holding up great! Make sure your fabricator uses an exterior glue for all edges and during the installation. This is so important! I've seen many outdoor projects fall apart due to other fabricators lack of experience and/or forgetfulness. If you can cover the area in the winter it will hold up much better. When using black or dark granites outdoors keep in mind that if the sun is shining directly on it, the granite will get HOT! Above is a beautiful barbeque that we installed here in Utah. The granite is Blue Pearl. The edge detail is a 5" Miter. 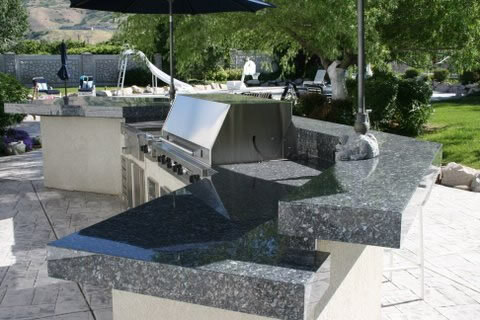 Also, check out this BBQ we did with Costa Smeralda granite.